Planning to store some of your home-grown potatoes to use this winter? Once you've dug them up, the next step is to cure them. Read on to learn how. Inspect your potatoes carefully, and remove any that you hit with your pitchfork or shovel. They're fine for tonight's dinner but won't hold up to long-term storage. Lay your remaining potatoes out in a cool, shady spot with high humidity, and leave them there for one to two weeks. Don't worry about removing all the dirt. They'll be much easier to brush off once the skins toughen up, and you'll be less likely to damage them. 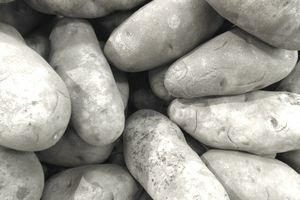 Check on your potatoes throughout the curing process, and discard any that develop mold, so it doesn't spread to other potatoes. Once the curing time is up, inspect your potatoes once more, and remove any with imperfections. Then, store your potatoes for the winter. Some potatoes store better than others. Increase your chance for success by choosing one of the keeping varieties. Allow your potato vines to die back completely before you dig your potatoes. They'll keep longer if you do. Cut back on your watering a couple weeks before harvest to toughen up the potato skins. Harvest your potatoes on a dry day, and take care to keep them out of the sun. Exposure to sunlight will turn them green (and green potatoes are actually toxic). Growing heirloom varieties? Be sure to hold some back to use as next year's seed potatoes.